The advantages for the user are obvious. In the past, it was necessary to decide in favour of one of the three technologies. Now, with the VTC 315 DS, it is possible to choose the technology that best suits individual applications. Dr. Guido Hegener, the executive responsible for grinding technology at EMAG Salach Maschinenfabrik GmbH, comments on the diverse applications: “We are consistently following the path of combination machining. As a rule, our customers manufacture different workpieces on the machine. We intend to offer them the best technology for every application.” The VTC 315 DS is of interest to those engaged in the manufacture of medium and large batches of high-quality components such as gear shafts, rotor shafts, pump shafts, motor shafts or cardan shafts. The machining technology is chosen accordingly. Sturdy workpieces are machined using the scroll-free turning technology. The grinding technology is preferred for smaller, less stable components. “This makes us more flexible and allows us to choose the right technology for every individual requirement”, explains Dr. Guido Hegener the advantages. The machine can be used as a fully-fledged grinding machine, or a fully-fledged turning machine, or a combination of both. When choosing a technology one should take a closer look at the cycle time and, in particular, at the tooling cost. Unit production costs are usually higher with hard turning and scroll-free turning than with grinding, although CBN grinding wheels – in absolute terms – are rather expensive. It is for this very reason that the user has to decide on a case by case which manufacturing technology to use. This guarantees flexibility in the use of the machine and opens up a wide range of applications, especially as all the technologies can be applied also in combination. The VTC 315 DS is ideally suited for complex manufacturing processes. Whether the job includes the high metal removal rates of turning and milling or the gentler grinding process – the VTC series of machines offers the possibility to integrate most of the metal cutting processes. 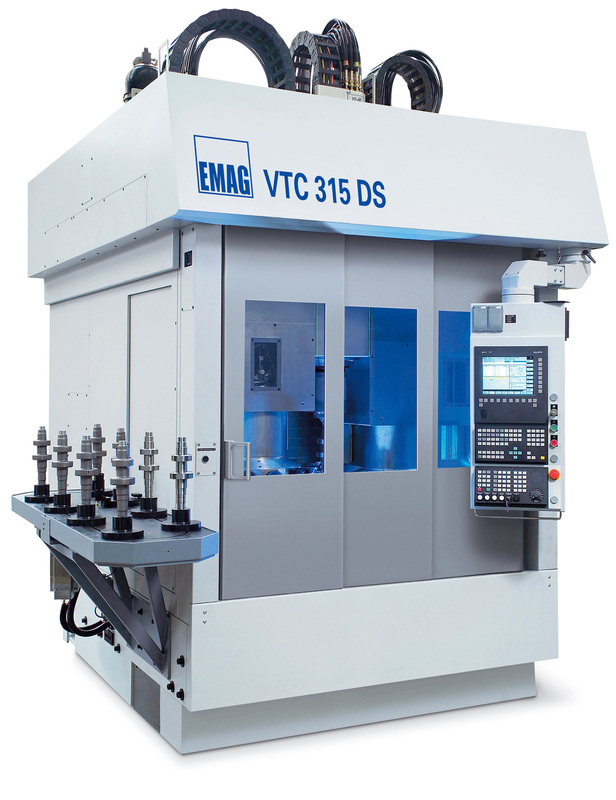 This allows for the creation of complete VTC production lines for soft and hard machining. Turning, milling, drilling, grinding and gear hobbing have already been modularised for this particular machine platform. It provides the VTC with an extensive field of application. “We have already installed complete production lines of VTC machines for the soft machining of crankshafts. Almost all of the operations could be accommodated on machines from the VTC series”, this is how Markus Woitsch, chief of the production team for shaft machines, explains the production line concept of the VTC. Naturally, subjects like spare part stocks and unified machine operation also play a decisive role in the eye of the customer. With a production line that interlinks a number of different VTC machines and utilises different manufacturing technologies, spare part stocks can be drastically reduced, as 80% of the VTC machine components are the same. Only the technology modules change, when a VTC has to be adapted for a new machining requirement. The VTC 315 DS accommodates turning as well as grinding technologies. For example, the turret carries out all turning operations, while the second station is used for the grinding work. This way, shafts can be complete-machined: the cylindrical bearing seats, the shoulders and the grooves – all machined in a single set-up. “Clamping errors play a particularly important part when it comes to high-performance components. Radial runout can be much reduced when a workpiece does not have to be re-clamped several few times”, elucidates Dr. Guido Hegener on the quality of the machine. 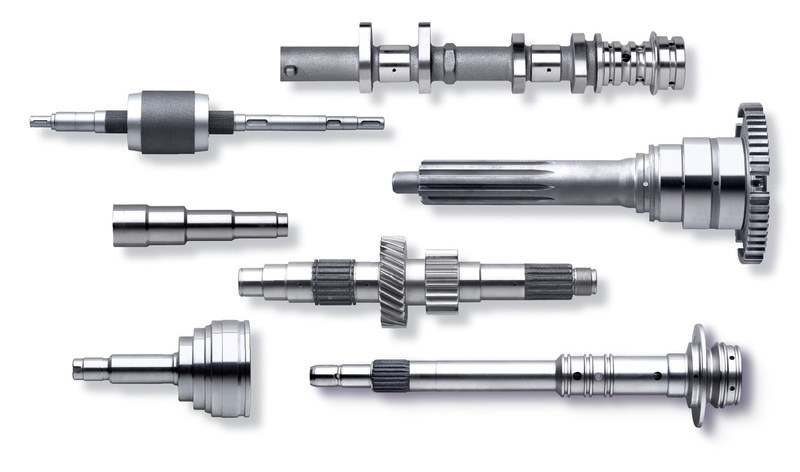 To keep downtimes caused by tool changes to a minimum, sister tooling is provided for all turning operations. And the tool life of grinding wheels is so high that the time taken up by a wheel change is of no consequence. A distinguishing feature of the VTC 315 DS is its sturdiness and rigidity. At its heart is the machine base in Mineralit® (polymer granite). The damping properties of this material is 8 times that of grey cast iron, which makes it particularly well suited for hard machining operations like grinding or hard turning. The results are improved tool life and a better surface finish. The vertical design also aids unhindered chip flow. Manual removal of chips is hardly ever necessary. This is particularly important in soft machining, as it often involves volume-intensive chipping operations. The vertical construction is also of advantage where the footprint is concerned. 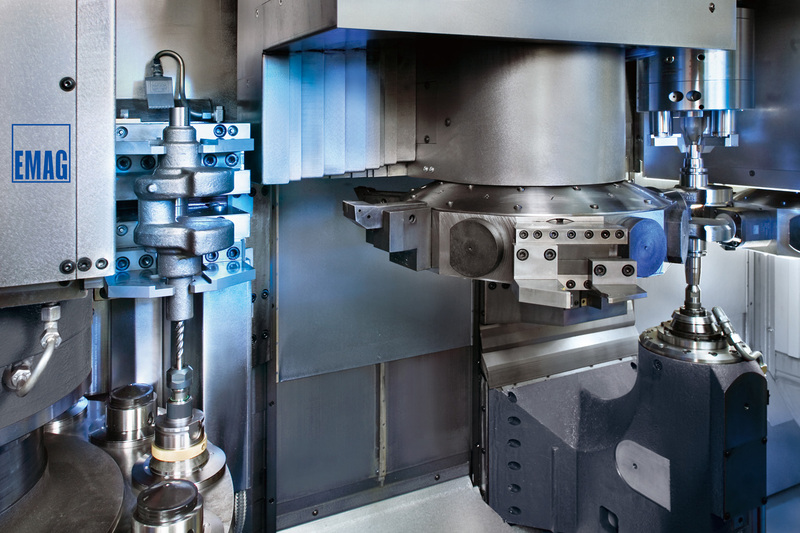 Machines with horizontal spindle and tailstock take up a lot of space width-ways. That raises floor space requirements and costs money. Vertical machines develop upwards, and that – as we know – costs nothing. Automation on the VC 315 DS lies in the turret. A gripper, housed in the turret, collects the raw-part from its storage section and transfers it to the clamping position. Once the workpiece is machined, it is transferred out of the machine the same way. And thus the machine automates itself. The generously dimensioned machine assemblies, such as the work spindle with 330 Nm constant torque, and the grinding spindle with a power rating of 30 kW, have so much reserve capacity that even heavy metal removal work can be carried out on the machine. The control system used is a Siemens 840 D with EMAG grinding software that simplifies programming and operation.